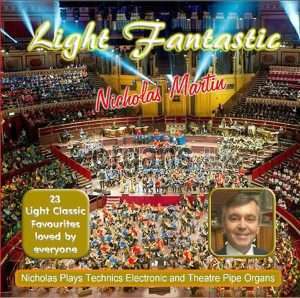 Nicholas Martin has two releases this November, the first one is a compilation which plucks the best light classical pieces from his various recordings and places them neatly together on one CD. Penny Weedon did the same thing in 2014 with her “In Classic Style” CD, but this pushes that to the limit with seventy-seven minutes worth of some of the most popular classical pieces and virtually all of them instantly recognisable. All but three of the tracks are recorded on Nick’s most recent Technics model, the FA-1, plus there are three Wurlitzer tracks from his tenure at Turners Musical Merry-Go-Round. As you would expect, Nick’s playing is excellent throughout and shows what the FA-1 can sound like in the capable hands (and feet) of an expert. It’s far better to listen to someone who knows what they’re doing on an older organ, than someone who doesn’t on the latest model! The orchestral presets of the Technics may not be as ultra-realistic as the new keyboards, but when there’s a lot going on in the arrangements, it can hold its own. Even on sparse tracks like “Meditation” when the solo violin is laid bare, it still sounds impressive. The (sx-)FA-1 was released in the mid-1990s, with the first CD release being Phil Kelsall’s “My Way” in 1996, with Nicks first recording following in 2001 with “My Concerto For You”. The dexterity on the opening “Sleeping Beauty Waltz” is remarkable enough, until you hear track two and “Flight of the Bumble Bee,” then we get “Warsaw Concerto” and so on… Every track on the CD is pretty noteworthy and even though I’m not really a fan of compilations (or complete classical CDs for that matter), this is a stand-out recording which is a joy to listen to. As it’s a classical selection, it doesn’t feature the drawbar side of things, just the orchestral sounds of the organ.